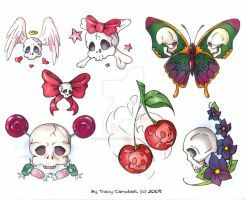 My first and, let's face it, only tattoo design, done in 2001 for one of my closest friends. Unfortunately he got a different tattoo while I was finishing this one up, and to this day, he's covered in tattoos but not this one. Feel free to use this if you'd like to put some leaves on your body. I'm writing this 7 years after I drew it and I'm still in love with this piece.